Embattled Virender Sehwag was today handed another lifeline to push for a World Cup berth after being recalled to the Indian squad for the first two matches of the one-day cricket series against Sri Lanka along with paceman Munaf Patel. Munaf Patel (left) and Virender Sehwag have made a comeback to the Indian squad for the first two one-day matches against Sri Lanka. Zaheer Khan produced a devastative spell of fast bowling to put Mumbai in a position of strength against Bengal on the second day of the Ranji Trophy final at the Wankhede Stadium here today. President A.P.J. Abdul Kalam has promulgated an Ordinance whereby viewers across the country will be able to watch the upcoming India-Sri Lanka cricket action live. Jyoti Randhawa today wrote a new chapter in his unending romantic tale with the Majlis Course as he hit a hat-trick of birdies to move to tied second spot on the third day of the Dubai Desert Classic. The 34-year-old Indian played 26 holes on Saturday and came out with flying colours at the Emirates Golf Club. Feats of daredevilry, bullock-cart races and athletic competitions marked the Kila Raipur Games today at the Grewal Stadium in Kila Raipur, near here. Sports Wing, Nehru Garden, Sports Wing Kairon and HMV College bagged three points each by winning their league matches in the Western Union Six-A-Side Punjab Hockey (women) tournament at the Olympian Surjit Hockey Stadium here today. Guru Nanak College, Phagwara, edged out Chandigarh Football Academy 2-0 in the final of the college category on the concluding day of the 45th Principal Harbhajan Singh Memorial Football Tournament at Mahilpur today. The winners received Rs 20,000 and the runners-up Rs 15,000. Greg Morgan took a hat-trick as New Zealand Under-19 dismissed Indian colts for a paltry 124 and gave a strong reply in their first innings in the third ‘Test’ at Bert Sutcliffe Oval at Lincoln. Sehwag, who was dropped for the recent series against the West Indies following a prolonged form slump, was expectedly brought back into the team with the national selectors keen to assess his form before the World Cup squad is announced on February 12. Patel, who missed the series against West Indies because of an ankle injury, also made a comeback while Suresh Raina, Ramesh Powar and Gautam Gambhir were dropped from the 15-member squad announced by BCCI secretary Niranjan Shah after the selection committee meeting. The selectors also reposed faith on struggling paceman Irfan Pathan who has been retained in the squad which is more or less the squad envisaged for the mega event to be held in the West Indies in March-April. With most of the slots having been decided, the selectors will get just two more matches to make up their minds on the fringe players before the final squad is announced here. 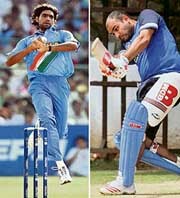 Sehwag “will bat at four, five or six,” said selection panel chief Dilip Vengsarkar. “We wanted to give him a break to regain his form, so we left him out of the team for the four one-dayers. We hope he does well,” said Vengsarkar when asked why the selectors have brought back Sehwag ignoring him for the series against the Windies. “We will see how he performs in the first two one-dayers (against Lanka),” the former India captain said, giving a clear indication that the Delhi marauder has to prove his form before being considered for the World Cup. The 15-member squad for the World Cup, as well as that for the last two ODIs against Lanka, is to be picked here on February 12. The fact that Sehwag’s name was the 14th declared by Shah gives a clear indication that there was some debate over his choice. “Anil Kumble and Harbhajan Singh are there to bowl spin. Sehwag can additionally bowl off spin,”Vengsarkar said. Asked whether the selectors now saw Sehwag as a middle order batsman with Sourav Ganguly and Robin Uthappa as the two first-choice openers, Vengsarkar said: “not necessarily”. The first two one-dayers is to be played at Kolkata and Rajkot on February 8 and 11 respectively, followed by matches at Goa (Feb 14) and Visakhapatnam (Feb 17). The meeting was also attended by captain Rahul Dravid and coach Greg Chappell. South Zone selector Venkatapathy Raju, however, was absent due to his father’s death on Thursday. Munaf Patel received a clean chit after undergoing a MRI scan in his right ankle last evening. “He has been declared fit to play by team physio John Gloster in his report,” said Shah. Sreesanth was the 15th and last player announced by Shah making it quite clear it was a touch and go affair for the swing bowler from Kerala after his disappointing show in the series against the Windies. “He has not adjusted his length and he’s to do so on wickets and in conditions where there is not much movement off the wicket or in the air,” Vengsarkar said. The non-selection of Rudra Pratap Singh and Joginder Sharma who had been part of the squad for the initial part of the series against the West Indies indicated that they were not anymore in the reckoning for a World Cup berth. Vengsarkar also hinted that the choice for the World Cup would be confined to the 15 plus the three omitted for the first two one-dayers against Sri Lanka. He denied that there was any idea to rest Sachin Tendulkar or any other key player for the matches against Sri Lanka as has been speculated in the media. “He’s fit and fine. Our main focus is to win the series. After that we may think about it,” he said. Vengsarkar said that fielding remained the area that needed improvement. The Indian squad is to depart for the World Cup on February 28. Playing his first match for Mumbai, Zaheer claimed five for 40 to dismiss the visitors cheaply for 143 and give the hosts a healthy 177-runs first innings lead. At close, Mumbai were 113 for two in their second stint, enhancing their lead to 290 runs with first innings centurion Wasim Jaffer (50) and Wilkin Mota at the crease. The morning session, however, belonged to Bengal. Resuming at 281 for five, Mumbai lost their remaining five wickets for just 39 runs and ended up with 320 in the first innings. Medium pacers Ranadeb Bose (4-77) and Sourav Sarkar (2-76) shared the spoils. However, the good work by the visiting bowlers was undone by an inept batting display. Mumbai came back in to the match strongly as they exposed the Bengal batting that had performed well in the previous matches. After Ajit Agarkar struck in the very first over, there was no looking back for Mumbai with Zaheer taking control thereafter. The left-arm pacer was on a hat-trick once, when he took three wickets before lunch including the prized one of Ganguly for first ball duck. Having lost four wickets by lunch, Bengal’s only resistance came in the form of young Manoj Tiwari, the second highest run scorer in the championship this season, and experienced Rohan Gavaskar. The duo put on 44 runs for the fifth wicket. But a poor shot selection by Rohan, especially considering the situation which demanded discipline and concentration, put the visitors in further trouble. On a day dominated by the bowlers, at least in the opening two sessions, the Bengal batsmen neither showed the technique nor the character to stuck it out as they folded up before tea. Mumbai following the early departure of opener Sahil Kukreja, recovered well with half-centuries from Wasim Jaffer and Rohit Sharma. Fall of wickets: 1-3, 2-14, 3-201, 4-268, 5-268, 6-298, 7-298, 8-299, 9-314. Bowling: Bose 29-9-77-4, Sarkar 21.4-5-76-2, Ganguly 16-4-30-1, Dinda 16-5-67-0, Lahiri 16-0-69-2. Fall of wickets: 1-0, 2-3, 3-28, 4-28, 5-72, 6-72, 7-72, 8-106, 9-108. 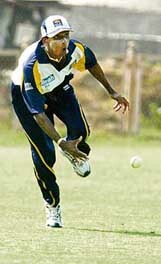 Bowling: Agarkar 10-2-42-1, Zaheer 11-2-40-5, Mota 4-0-21-1, Nair 3-0-18-1, Powar 4.1-0-22-1. Fall of wickets: 1-6, 2-113. The Ordinance makes it mandatory for sports channels, radio stations and content providers to share the live telecast with public broadcaster Prasar Bharati in respect of sporting events of national importance at home and abroad. The Ordinance comes after the Union Cabinet on Thursday approved the proposal. Thereafter, Union Information and Broadcasting Minister Priya Ranjan Dasmunshi called on the President and apprised him why the Congress-led UPA government desired such a course of action. The government was compelled to rethink its strategy after cricket buffs in the country were fuming at having missed out the direct telecast of the just-concluded India-West Indies one-day series. On their part the private broadcasters who have purchased the telecast rights have threatened to go to the court. In an effort to soothe the ruffled feathers of the private broadcasters, the government has suggested that a technical committee will look into the matter of encrypting the signals being telecast by Prasar Bharati's Doordarshan so that the feed is not accessed outside India. Clearly, the Government has kept in mind the next month's World Cup cricket extravaganza being held in the West Indies. The Sports Broadcasting Signals (Mandatory Sharing with Prasar Bharti) Ordinance 2007 will facilitate millions of cricket fans in non-cable households and radio listeners to receive the live feed of the Indian team's one-day matches. However, for the Test matches, the government has said the live feed would be required only for matches played in the country while those played abroad, a ‘highlight-package’ would be sufficient. Jyoti Randhawa today wrote a new chapter in his unending romantic tale with the Majlis Course as he hit a hat-trick of birdies to move to tied second spot on the third day of the Dubai Desert Classic. The 34-year-old Indian played 26 holes on Saturday and came out with flying colours at the Emirates Golf Club. He first completed the second round, suspended yesterday due to inclement weather, with four-under 68 and then compiled a five-under 67 that moved him to 15-under. Randhawa, whose sensational hat-trick of birdies came on the 16th, 17th and 18th holes, was two strokes behind three-time champions Ernie Els who was on top at 17-under 199. Randhawa shared the second place with Dubai-based Swede Henrik Stenson (69) and Ross Fisher, who shot a 71 after two successive 65s. Tiger Woods is very much in the frame, battling with his putter, but still putting together a 67 that now places him three behind Els. Randhawa goes out in the lead group with Els and Stenson, while Fisher gets to play with Woods, for whom he once ranged balls at the World Matchplay in Wentworth in 1998. India’s other challenger, Jeev Milkha Singh, was also in the frame at tied 13th with a card of 67 that included four birdies, an eagle two and just one bogey. Calling it his best in last three weeks, Jeev was at 10-under 206, seven behind leader Els. Manila: Gurbaaz Mann shot a four-under 68 to make a giant leap to sole fourth place on the third day of the Philippine Open here today. The 24-year old was 36th overnight and his 3-under 213 overall has put him in a perfect position to post his first career top-10 finish on the Asian Tour. Local hero Frankie Minoza shot a five-under 67 to move closer to his second title with the third round lead. 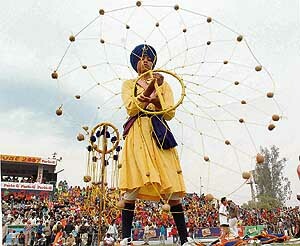 Feats of daredevilry, bullock-cart races and athletic competitions marked the Kila Raipur Games today at the Grewal Stadium in Kila Raipur, near here. Several hair-raising feats, including lifting of a plough with the teeth, bending a steel rod with chest, and pulling a Maruti car and a tractor with hair were performed on the day three of the games. Bullock carts of Jyoti from Dhano, Dhoor Singh from Lohgarh, Jagtar Singh from Dhoor Kot, Rana Singh from Dehlon, Ranjit Singh from Maherna Kalan, Ranbir Singh from Gujjarwal, Bela Singh from Langh and Cheenu from Jallaldiwal retained first positions in their respective heats. Deepa from Lohgarh, Major Singh from Hathoor, Mahinder Singh from Dehlo, Shingara Singh from Sarwarpur, Biloo Singh from Ghaloti, Ranjit Singh from Assi Kalan, Nirmal Singh from Dhano and Manveer Singh from Gujjarwal reached the quarterfinals by retaining second positions in these heats. In senior hockey, BSF defeated Grewal Club, Kila Raipur, 2-1 and Shahbad team pipped Jalandhar 1-0. Jalandhar men defeated Mastuana team 3-0 in volleyball. Meanwhile, the organisers felicitated Mr Prabhjot Singh, Bureau Chief, The Tribune, for his commitment to development journalism, and Mr Balbir Singh Senior for representing Indian hockey team in Olympics thrice. Mr Pargat Singh, Mr Ashok Dhyan Chand, Gill Surjeet, Dr K.S. Aulakh, VC, Punjab Agriculture University, and Manjit Kaur, athlete, were also honoured for their distinguished achievements in their respective fields. Other results: 100m (men): Vishal Saxena from Patiala Railways 1, Saraj from Jalandhar 2, Bhagwant Singh from Punjab Police 3; 200m (girls): Deepti from Sunam 1, Harpreet Kaur from Ludhiana 2, Jaspreet Kaur from Maler Kotla 3; 1500m (men): Divashker Giri from SAI Patiala 1, Davinder Singh from PSEB 2, Vishavjeet Singh from Batala 3; 800m (women): Anupama Shrivastva from Hoshiarpur 1, Gurjit Virk from Sunam 2, Manpreet Bal from Jalandhar 3, long jump (men): Maha Singh from Sangrur (7.23m) 1, Samsher Pratap Singh from Jallandhar (7.21m) 2, Bhupinder Singh from Patiala (6.78m) 3. In today’s matches, sports wing, Nehru Garden, thrashed Patiala C 25-0. Zenith Lehal scored 16 goals. The other scorers were Mandeep (4), Pooja (3) and Maninder Kaur (2). In the second match, HMV College, Jalandhar, crushed Doaba Khalsa Model School, Jalandhar, 23-0. Jiwan Jyoti struck a hat-trick as she sounded the board five times. Vandana (5), Amandeep (4), Baljeet (5), Sukhmanjit (3) Harinder (1) were the other scorers. Gurdaspur B beat Patiala B 8-2. The scorers for the winners were Anu Bala who hit a hat-trick plus two more goals and Gurdeep Kaur (2). For Patiala, Mandeep Kaur and Ramanpreet Kaur scored one goal each. Government College, Ludhiana, beat Patiala A 3-0. Parjeet Kaur struck twice while Mamta scored one goal. BBK DAV College, Amritsar, beat Doraha 6-0. The scorers for the winners were Sania (3), Kulbir (2) and Prabhjot (1). Sports Wing Kairon beat Khalsa College, Ludhiana C 11-1. The scorers were Ramandeep (5), Lakhwinder (2), Paramjit (2) and Sandeep (2). The lone scorer for Ludhiana was Navdeep. Khalsa College, Ludhiana B, beat Khambra Academy Jalandhar 7-0. The scorers for the winners were Chandni (4), Mamta, Sunaina and Gurpreet. The match between SD Phularwan School, Jalandhar, and Khalsa College Ludhiana B ended in 4-4 draw. In the club category final, JCT got the better of JCT Academy 4-2 via the tie-breaker. The winners were awarded a cash prize of Rs 50,000 and the runners-up Rs 40,000. The tournament will be upgraded to the national level next year.